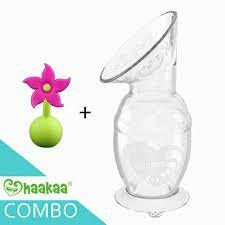 And now can now get the Haakaa breast pump and silicone flower stopper as a value bundle! The little stopper sits tight in the neck of your pump and will stop any spills or accidents. Your breast pump can now be suctioned to the table with your suction base and also protected from spills and contamination with your flower stopper, both with an easy one handed action. It truly is the simplest way to express anytime and anywhere you need to. It works by suctioning onto the breast and then the pump does the work for you by suctioning and drawing your milk naturally. So you can use it solely to catch additional milk, or for use while travelling, or it can completely replace your electric pump and do all your pumping for you. Safe for you and your baby – made from 100% food grade silicone. 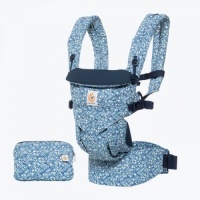 Fits comfortably into any handbag or baby bag. Once the breast pump becomes full, empty into a storage bottle/bag or use the compatible Haakaa lid or stopper to store in the pump itself and keep it sterile. I’ll be buying one of these for all my friends in future! Such an easy way to express. Very good for catching milk from the breast your not feeding from which is such a waste of the very precious milk. This is handy for draining excess foremilk, and/or hand expression, without getting into a pumping cycle. Very easy to use, clean and store! I was recommended this by someone who has also used electric pumps, which I found quite painful. I am excited to try it, and the idea of only having one thing to clean is amazing. I have been an Earth Mother customer for a few years now and the customer service has always been amazing. Siobhan is great to talk to and on one occasion when there was an issue with an order, she resolved it quickly and beyond expectations. I will always recommend Earth Mother and support such businesses. With my previous babies I used a manual pump and while it did the job it was quite uncomfortable, finicky and had lots of parts to be cleaned and reassembled. The Hakaa is completely different, one piece to clean, the suction grips it in place so you can almost use it hands free, it collects all of the let-down which is normally wasted. Can also manually pump with it too if required. I've used this for the last 3 days, only collecting from two feeds per day, and I already have a nice stock of milk in the freezer for future bottles. Super easy! Has its place, comparing it to an electric pump, the haakaa is quick and easy to clean and sterilise, and portable for some relief if away from baby for a while, but it's not quite as quick if you want to pump a lot for use later. The Haaka is a great idea and can be used to catch the let down on the opposite side to which baby is feeding. Hands free, once you get it comfortable attached, and naturally draws the milk. 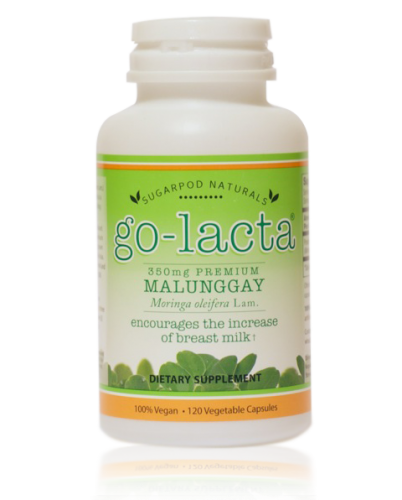 Great for saving milk that would usually go to waste in a breast pad. However the lid does not stay on the Haaka while in a hand bag meaning it is no longer sterile. Very convenient for use at home.